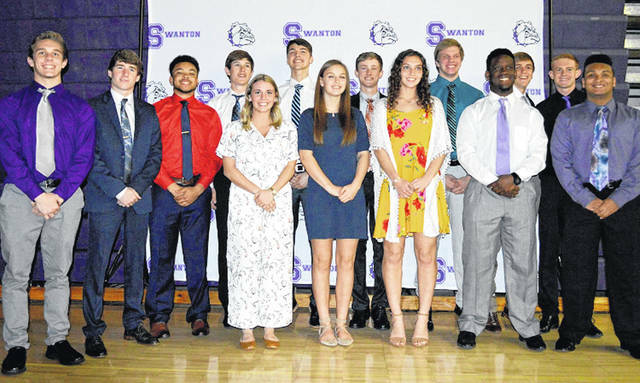 As part of its athletic hall of fame induction ceremony on Saturday, March 30, Swanton also awarded their senior athletes who have participated in two or more sports all four years of high school on this night. Front row, from left: Bridget Harlett, Hannah Grabke, Allyssa Westfall, Xavier Williams, Zaven Waddell. Back row: Ryan Marvin, Zach Schaller, Hunter Mix, Austin Luce, Donovan Avalos, Carter Swank, Randy Slink, Dylan Gilsdorf, Brett Bettinger.